Early on New Year�s Day 2004 I thought to listen to the First Rhapsody and ended up hearing all six! These recordings were old friends since they came out one by one coupled with the Symphonies (now separately boxed), but I don�t think I had ever made the experiment of hearing them as a sequence. The experience led me to a number of reflections. The first was that, if Ireland ever were to have a great international musical festival equivalent to the Prague Spring Festival, then the Irish Festival should open each year with a performance of these works given as a cycle, just as the Czech Festival always opens with Smetana�s Ma Vlást. Yes, I know that Smetana�s six symphonic poems were planned as a cycle whereas the Stanford Rhapsodies were written over a period of just over twenty years, but, whether by accident or design, they add up to a remarkably satisfying sequence; a vigorous, ear-catching prelude enshrining Ireland�s best-loved melody (no. 1), a sombre, elegiac, mostly slow piece (no. 2), an idyllic miniature cello concerto (no. 3), another sombre piece which this time expresses ultimate faith in his country�s destiny (no. 4), a piece which is by turns lively and tenderly reminiscent (no. 5) and a work with a violin soloist (no. 6) which is practically an extended slow movement, a grave and tender farewell to the country which Stanford was not to see again, with a final brilliant coda to round it off. Furthermore no. 6, by revisiting, lovingly and tenderly, that same "Lament of Owen Roe O�Neill" which had, in a more grimly heroic mode, dominated the Second Rhapsody, appears such a perfect epilogue to the whole cycle that it is difficult to avoid thinking that the composer, while writing it, must have cherished an untold dream that the whole cycle might one day be gathered together and heard as a whole. Another obvious difference with Smetana is that Stanford is using traditional Irish melodies while Smetana mostly used themes of his own (and the Hussite hymns introduced in Tabór and Blaník are generally held to be the weak points of the cycle, at least for non-Czechs); yet so convincingly has Stanford absorbed them into a colourful late-romantic-nationalist style that I feel this point is of no real account. What we hear is a cycle of fine pieces that can be enjoyed by anyone who has a taste for nationally-oriented orchestral music written in Bohemia, Norway, Russia and so on. And note that I make my comparisons with composers like Smetana, Grieg and Glinka rather than Kodály and Bartók who were already active during the years (1902-1922) in which Stanford wrote his Rhapsodies; yes, Stanford was something of a time-warp, but need that matter a hundred years later as much as it probably did in his own day? It is no more reasonable to criticise Stanford for not adopting the more radical treatment of folk-melodies practised by his English pupils Holst and Vaughan Williams than it is to criticise Smetana for not being Jan�ček. And let us remember that, while Smetana was followed by Dvoř�k, Jan�ček and Martinů, no such comparable Irish figures emerged in the mid-Twentieth Century. All the more reason to value Stanford�s fine work, then. Yes, you will, be saying, but Smetana is known the world over and, if complete performances of Ma Vlást are rare outside the Czech Republic, Vltava is a "classical pop" and From Bohemia�s Meadows and Fields is pretty well known too. Could the Stanford Rhapsodies have the same worldwide appeal? Well, quite frankly, I can�t for the life of me see why not. The melodies themselves are unfailingly beautiful � folk melodies but shaped and extended with genuine inspiration. Stanford�s orchestral colour is as wide-ranging and imaginative as anything else in the late-romantic line and each piece is formally well-wrought and satisfying. It has to be noticed that the sequence of Irish Rhapsodies was a fairly late flowering in Stanford�s composing career, gradually taking the place of the symphony as his preferred orchestral form; the seven Symphonies were composed between 1876 and 1911. Interestingly, however, the composition of concertos for solo instrument and orchestra covered virtually his whole creative life (1873-1919). Another important point is that between 1876 and 1900 Stanford published approximately 250 arrangements of Irish melodies for voice and piano, mostly gathered into the three collections with words by his friend Alfred Perceval Graves: Songs of Old Ireland (50 settings, pub. 1882), Irish Songs and Ballads (30 settings, pub. 1893) and Songs of Erin, op. 76 (50 settings, completed 1900). To these must be added his loving if somewhat controversial volume The Irish Melodies of Thomas Moore, restored and arranged, op. 60 (119 settings, completed 1894) and a handful of single settings. All this adds up to a treasure house of beautiful tunes sympathetically and often highly imaginatively arranged, once the basic late-romantic standpoint has been accepted. Towards the end of this period he was also much occupied with editing the Petrie Collection of Irish Music, which was issued in 1902-5 and has been much criticised by later ethno-musicologists. Only a very small number of further arrangements, almost certainly requested by publishers, appeared from 1900 onwards. It can be seen, therefore, that the period of arranging and assimilating all these melodies was practically a prelude to the period (1902-1922) of using them creatively in the Rhapsodies. Contemporaneously, Stanford�s first cycle of Irish songs, An Irish Idyll, op. 77 (original melodies but much more deeply Irish in their manner of expression than anything he had written previously) came out in 1901, to be followed by Cushendall, op. 118 (1910), A Fire of Turf, op. 139 (1913), A Sheaf of Songs from Leinster, op. 140 (1913) and Songs from "The Glens of Antrim", op. 174 (1920). So the Irish songs too, as a parallel expression of Stanford�s Irishness, built on the earlier experience of the arrangements. The Irish elements in the earlier and undeniably attractive Irish Symphony (1887) seem a scissors and paste job compared with the Rhapsodies. We must remember, then, that Stanford was using, in his Rhapsodies, melodies which to him had titles and words; in the cases where the poetry was by Thomas Moore he would have encountered it in his earliest childhood, and we all know how indelibly tunes remain coupled with the words to which we knew them in our primary school days. Undoubtedly the key to the tempi and the general mode of expression of these Rhapsodies can be found by hunting down the melodies in the folksong collections (only no. 3 relies heavily on melodies to be found elsewhere). It has worried me over the years that Vernon Handley does not appear to have done this. The clearest demonstration can be found by comparing his lively, racy handling of the first section of the First Rhapsody (the words "Hurry down, hurry down, hurry down ever, From the wrack-ridden mountain and yellow, rushing river" would become a tongue-twister at this speed) with Stanford�s own remorselessly steady beat in his 1916 recording. Dimly, through the murk of the ancient recording, something much more momentous, akin to a Sibelius nature poem, can be discerned. However, listening to the six Rhapsodies consecutively and trying to take Handley on his own terms, I have to admit that the volatile, exuberant portrait of Stanford which emerges is an attractive one and, until such time as an alternative view is available, there is little point in going into detail. I shall merely note some slightly fussy phrasing at the opening of no. 4 (Nicholas Braithwaite�s Lyrita recording of this piece remains my favourite), undue haste in the first part of no. 5 (try singing "Moan ye winds, ye caverns call, / �Orro, orro!� to our sorrow, / While we bear �neath one black pall / Brian, Murrough, from Fingal" to the bassoon melody and you will see what I mean) and again at the end of no. 6, which is marked Allegro, not Prestissimo. This last section seems unduly short, the one formal miscalculation in the whole cycle, but I have an idea it would not sound so if it were taken at a more reasonable pace. But still, it is all skilfully prepared and given with verve and affection so let us be thankful for what we have. Twenty, twenty-five years ago, some of the Rhapsodies of Liszt became very popular. I think every Englishman since has called some work a Rhapsody. Could anything be more inconceivably inept? To rhapsodise is one thing Englishmen cannot do. It is true that Stanford�s Rhapsodies are under tight formal control, but if this is to be taken as proof of ineptitude, how terribly incompetent Brahms�s various Rhapsodies must have appeared to Elgar (in reality, we may suppose that he admired them). Generally, a rhapsody is unlikely to "rhapsodise", in the sense of proceeding as a formless improvisation; in the case of Brahms, Dvoř�k or Stanford himself, a rhapsody shares many elements with classical sonata form, while remaining free to import variants which might not have prevented a later composer from calling the piece a sonata or a symphony anyway. Elgar no doubt knew this, but "Stanford-bashing" was to become an increasing obsession with him and the occasion was too good to be missed. It is true that Stanford was not actually named (and Elgar, not Stanford, was an Englishman), but he believed himself the target and said so publicly, and at no time during the acrimonious wrangling that followed did Elgar attempt to deny that it was so. Stanford always had an ambivalent attitude towards music based on the sonata principle. The classical side of him idealised it as the epitome of formal perfection, but the romantic in him wished for the freedom to express a more personal programme, if only a basic one of a "darkness to light" nature. In the First Rhapsody he resolved this very neatly. Using only two themes, he extracted two elements from the first of them, allowing him to present the theme in the form of a perfect sonata-movement exposition. But the development is replaced by the "Londonderry Air", at first gentle and ruminative, then expanding to considerable heights of eloquence. After a varied recapitulation of the first theme the "Londonderry Air" is gradually reintroduced to close the work in triumph. So an emotional programme is combined perfectly with classical formal elements. This is not the place for a detailed analysis of the remaining works, which are all more complex (and incorporate more themes), but each of which succeeds in expressing an emotional programme through a variant of a classical formal type. Whether this amounts to "rhapsodising" is doubtful; but it is likely that the music is all the better for its formal strength. In one other respect Elgar was wide of the mark, for he declared that the English musician was little respected abroad. This hardly tallies with the fact that two of the Rhapsodies (2 and 4) had their première performances in Amsterdam�s famous Concertgebouw, under the baton of one of the greatest conductors of the day, Willem Mengelberg (or with the fact that, previously, two of his operas, one of his Symphonies, his Suite for violin and orchestra and some smaller works had been heard in Germany before they reached Great Britain), though it may reflect his own difficulties in obtaining due recognition. More recently the tables have been turned, but I am convinced that the Rhapsodies deserve a place in the international repertoire (I am less certain of the Symphonies) and I urgently recommend these discs to lovers of late romantic music the world around. Stanford wrote four concertos for piano and orchestra. The first was a very early work (1873) which, after a single performance in Cambridge in 1874, was suppressed by the composer. Suppressed but not destroyed; however, with so much mature Stanford still unknown there seems no strong reason to revive it now. The "official" First Concerto (available on Hyperion and reviewed by me on this site) was dated 1894. It has a good deal going for it but it was the Second Concerto (1911) which, after its first performance in Norfolk, Connecticut in 1915, attained a measure of popularity thanks to Benno Moiseiwitsch�s championing of it (it was also the only one to be published). The Third Concerto (1919) belongs to a group of late works for solo instrument and orchestra which exist only in a two-piano score. It was believed that the full scores had been lost, but Jeremy Dibble, in his recent book on Stanford (also reviewed by me on the site) suggests, surely rightly, that these short scores were all that Stanford made. There were no prospects of performance and, if the occasion were to arise, his fluent technique would have provided a full orchestral score in a matter of days. The late Geoffrey Bush, a strong advocate of the Second Concerto, realised an orchestral score of the Third which has been performed, so maybe we will have a recording of this one day. 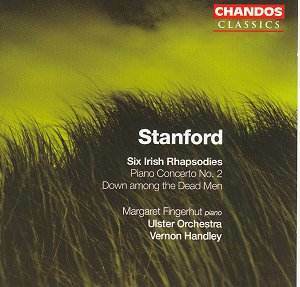 In between the first two concertos Stanford penned a set of variations on "Down among the Dead Men" (c.1897-8) which achieved a number of performances in its day, not least by Percy Grainger. Those of an analytical mind may care to look up Paul Rodmell�s comments in his book on Stanford (this, too, was reviewed by me together with the book by Dibble), in which it is shown that the composer (much as he was to do in the Rhapsodies) cross-bred elements of sonata form with variation form to produce a structure which is both ingenious and satisfying. Those less inclined towards musical analysis will nonetheless appreciate a clear-cut structure which sounds more like a short concerto in four linked movements than a set of variations. All should note the way in which, while the theme is often transformed out of recognition, the descending four-note motive heard at the opening (and extracted from the theme) appears as a motto throughout. More importantly still, the bluff nautical Stanford we know from "Songs of the Sea" and "Songs of the Fleet" derives any number of rousing new melodies from the theme, while finding space for poetic meditation in the "slow movement". The Second Concerto has been accused of opening with a virtual plagiary of Rachmaninov�s Second Concerto (which Stanford had recently conducted with the composer at the piano). The similarities are a) the piano starts alone (but with arpeggios, not chords), b) the music is in C minor and c) the orchestra enters with a heroic theme against piano arpeggios (but on the horns, not lush strings). Too much can be made of this when the continuation is so different from Rachmaninov and even the elements described above are put to a quite different structural use. Furthermore, hearing this work together with the Variations, for which no Rachmaninov model was available, reveals a basic consistency in style between the two. In the end, as so often with Stanford, the composer�s natural poetry wins out over his supposed models. Margaret Fingerhut is extremely responsive to the poetic moments in both scores. If in moments of great brilliance or weight she sometimes sounds penny-plain compared with Stanford�s gorgeous orchestral panoply, I�m afraid this is because Stanford was an experienced conductor with a flair for orchestral colour, but was not a comparable pianist. His piano-writing is sonorous and effective up to a point, but without providing that ultimate challenge to the performer which in its turn inspires him to give his all to the public (would he had plagiarised Rachmaninov more in this respect!). Fingerhut is truthful while Malcolm Binns, on Lyrita, sometimes tries to compensate by bashing, which resolves nothing. However, it is Binns�s mannered treatment of the opening of the slow movement which decides my preference for Fingerhut. It is on account of Stanford�s piano writing that the pianists of his days preferred to play not only Rachmaninov (there could be other valid reasons for this preference!) but concertos by the likes of Scharwenka and Paderewski which offered less musical substance but were pianistically more effective. In the same way, Dohnanyi�s "Nursery Rhyme" Variations are unlikely to be supplanted by "Down among the Dead Men". All the same, one wonders what a pianist such as Moiseiwitsch could have extracted from the concerto; frankly, neither Fingerhut or Binns is in this exalted category. Nicholas Braithwaite, conducting for Binns, has the London Symphony Orchestra in tow, and a number of details are better brought off than under Handley (whose horns are flabby at the outset). On the other hand, the Chandos performance has a greater sense of structural coherence which seems to emanate from Handley. In any case, there would seem little point in buying the Lyrita, a single full price CD containing just the Concerto and the Fourth Rhapsody (plus the brief Becket March under Boult) when for less than twice the price you can have the Variations and the other Rhapsodies as well. The recordings are good and Lewis Foreman�s excellent notes have been adapted here and there to their new situation.